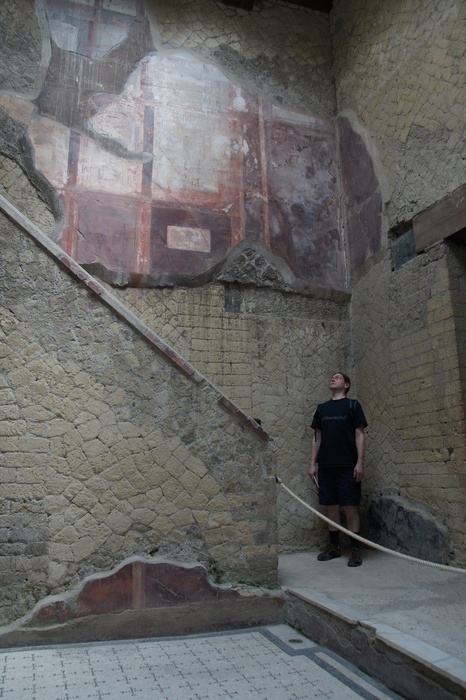 Eric, looking up the staircase beside the eponymous courtyard of the House of the Beautiful Courtyard. Ace in the House of the Beautiful Courtyard. 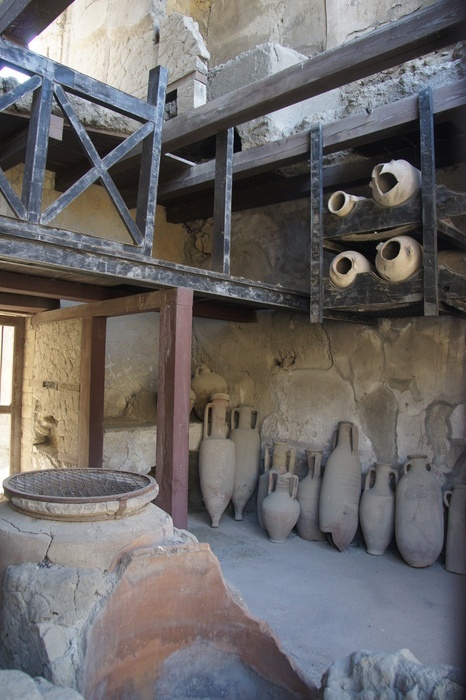 This room might have been used as a communal dining room. 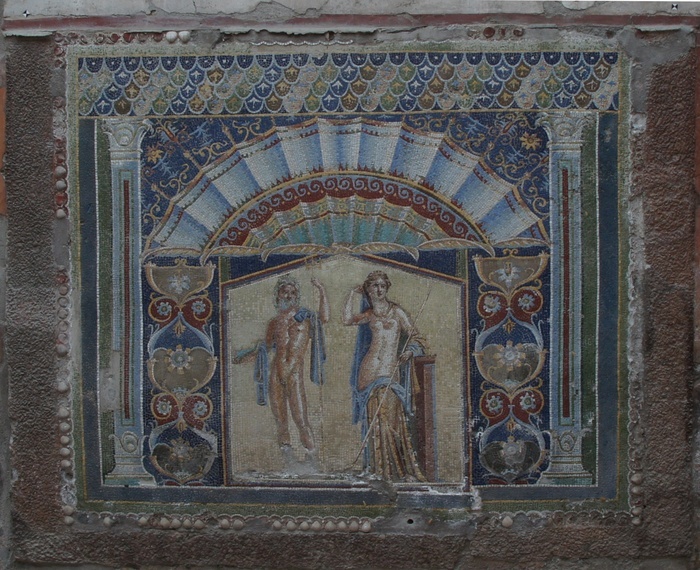 The House of Neptune and Aphrodite. The bright blues of the mosaic stand out against the fading frescos. The border is made of sea shells. 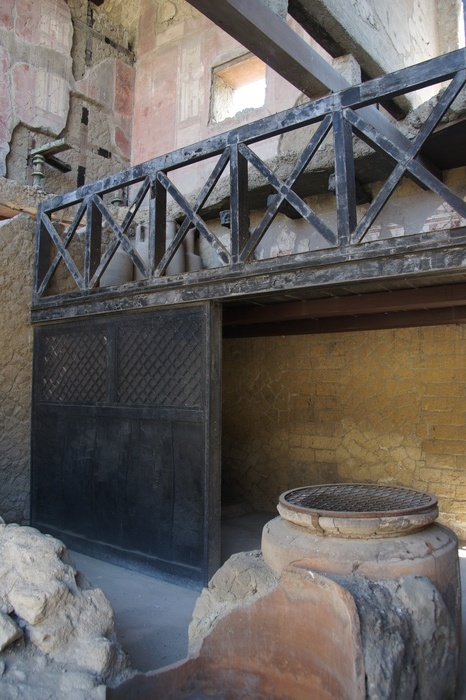 Although it looks a bit like a fireplace, this was a nymphaeum - a structure dedicated to the nymphs. They were generally constructed to resemble a natural spring, with a grotto and running water. This one had a tank inside which supplied water to the fountain. Most houses had a marble rectangle, something like this one, called an impluvium. 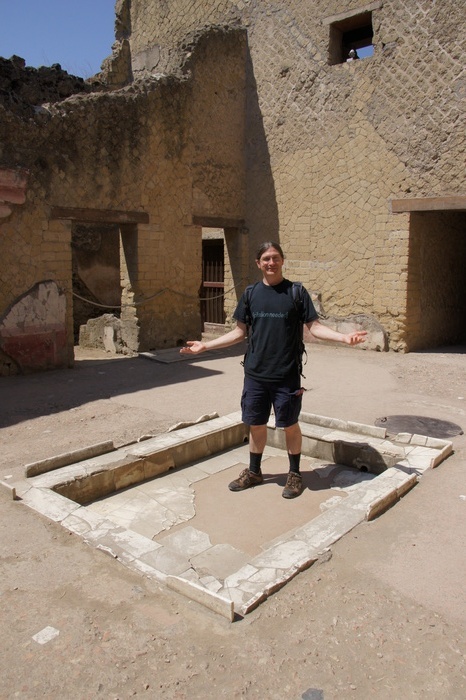 It served as an indoor pool to collect rainwater, which was directed from the roof through a compluvium. In warm weather the pool of water also served to cool the house. 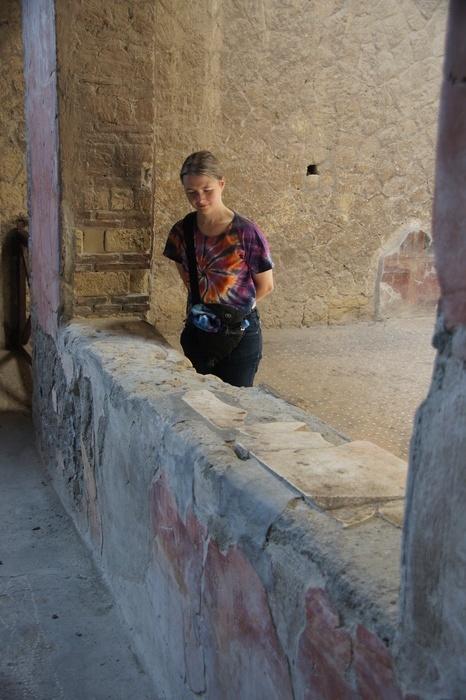 In most houses in the ruins, you could stand in - or on - the ancient marble. 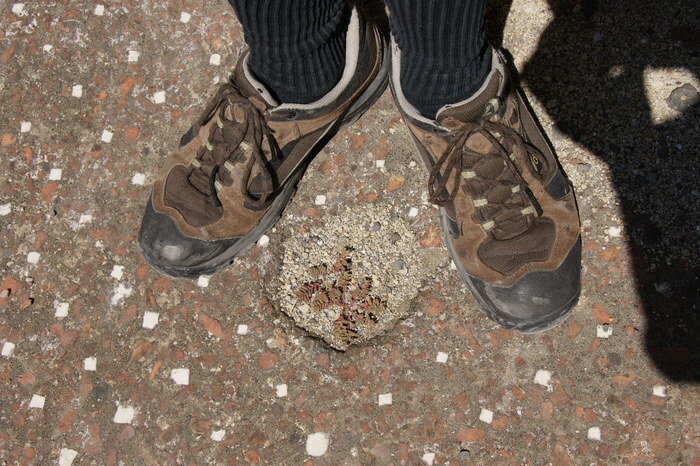 We carefully stepped over the marble pieces. 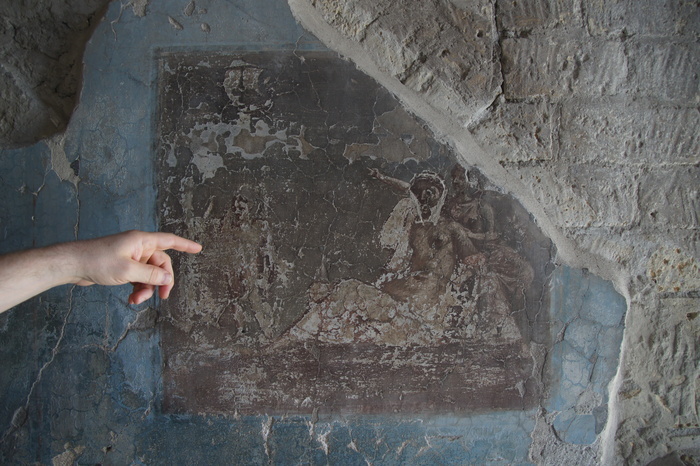 This shop must have been owned by the resident of the House of Neptune and Aphrodite, as the two connect through an inside door. The shop survived almost intact, including the wooden loft, shelves, and latticed partition. The jars contained broad beans and chick peas. The other side of the shop, showing the latticed partition (now protected by a plexiglas case). I have found no explanation for the pot with the metal grate on top... the grate looks rather new to me, so I expect it's a modern addition to protect the pot or its contents. This part of the wall has been broken away, not by fire or earthquakes, but by the butts of careless tourists who decided that a 2000-year-old wall was a good place to park their derriere. 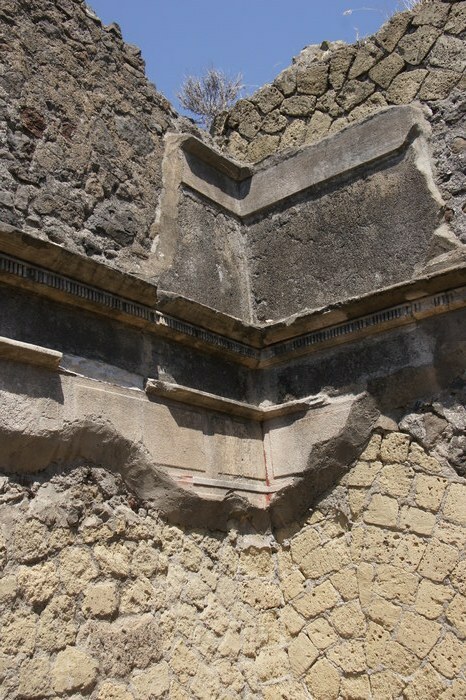 The wall is part of the Samnite house, one of many buildings in the area which was partly reconstructed after the earthquake of 62AD. 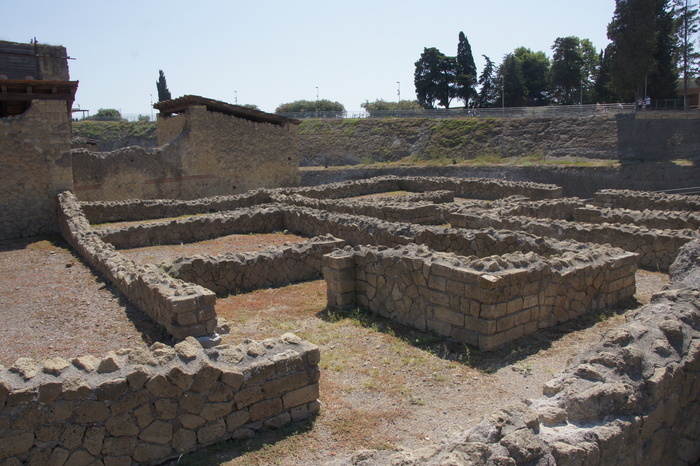 We now understand that such earthquakes are portents of an eruption for a volcano like Vesuvius, but the residents of Herculaneum did not know, and so they rebuilt and moved on with their lives. This house was rebuilt with a second entrance for the upstairs rooms, which were probably rented out. The plant kingdom making its claim on the buried city. Crown molding around the remains of a wall. Many of the frescos are not behind glass or bars, but are simply on the walls of the buildings which you can wander through at your leisure. Not only can you get close enough to touch one, but if it's crowded you have to be careful not to brush against them, taking away a few flakes of 2000 year old paint as a scuff on your clothes. 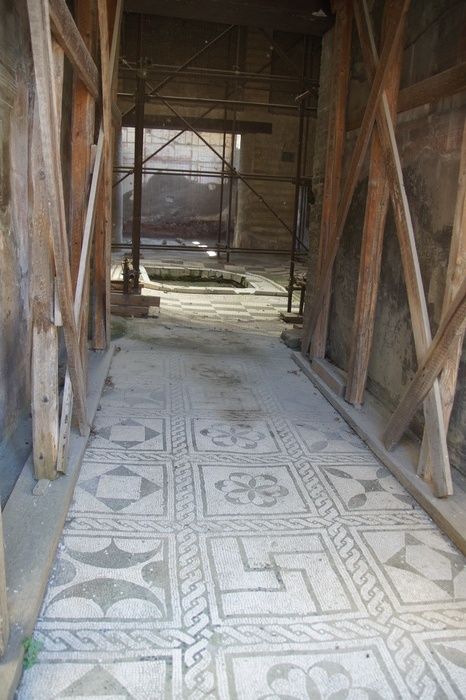 The House of the Mosaic Atrium was closed for repair, but set up so you could see its black-and-white atrium. In addition to its ostentatious atrium, this House had a very large room constructed in the style of a basilica, or public hall. 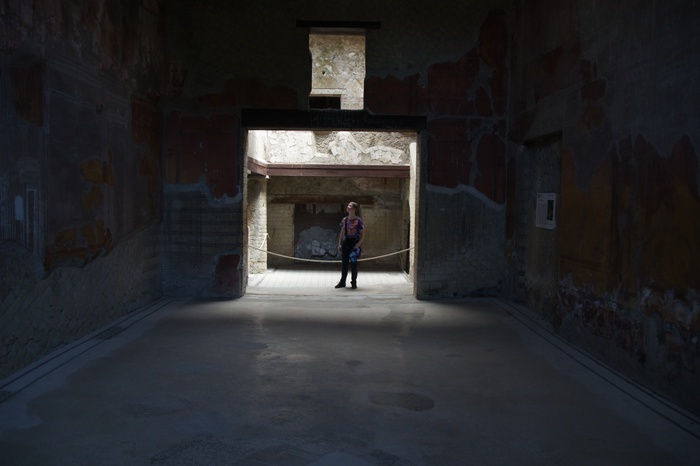 The room was probably used to host guests, deliberately alluding to the grand basilicas found in most Roman cities. 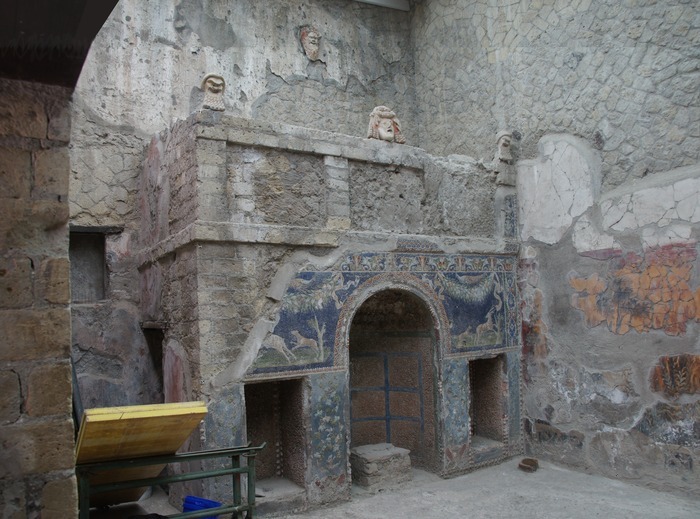 Not everything in Herculaneum was well preserved. 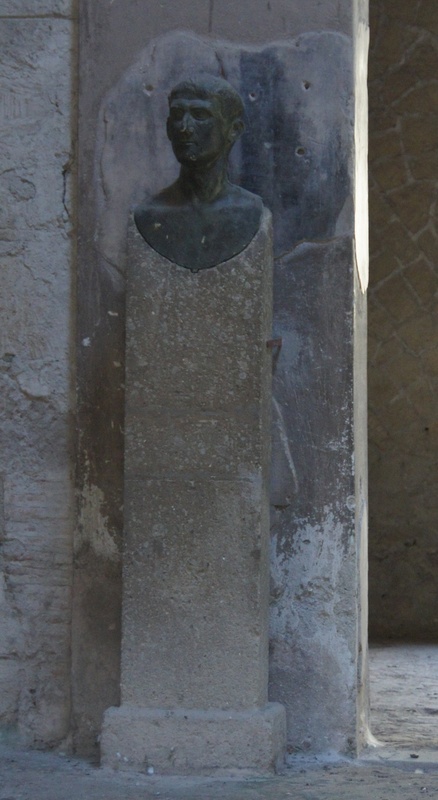 This house was closed, but you could spot the bronze herm (a bust on a pillar), believed to be of the home owner.